Minorities trail whites in college completion, but there has been more progress in closing gaps at the high school level. Persistent achievement gaps continue to bedevil policy makers and underline debates over inequality in the United States. 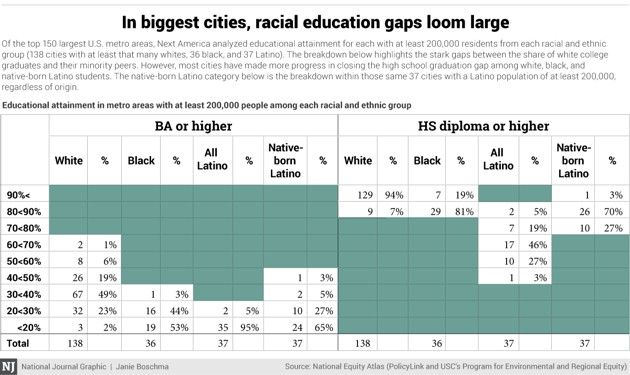 But even the figures on the racial gaps in educational attainment across the 150 largest metropolitan areas can somewhat understate the disparity because many of the communities where the highest percentages of African-Americans and Hispanics hold college degrees are places with relatively few of those adults. To adjust for that, Next America also analyzed both high school and college educational attainment levels in communities with the largest populations of whites, African-Americans and Hispanics. As the chart below shows, at least 200,000 whites live in 138 of the 150 largest metropolitan areas. In 129 of those 138 communities, at least 90 percent of whites hold a high school diploma; in the other nine, at least 80 percent of whites hold such a diploma. At least 200,000 African-Americans live in 36 of these metropolitan areas. In all 36 of those communities, at least 80 percent of adult African-Americans also hold a high school diploma (though only in seven of them do black adults reach the 90 percent level more common among whites). Latinos equal 200,000 or more of the population in a comparable 37 large metropolitan areas. In just two of those 37 (both in Florida—Orlando and Miami) does at least 80 percent of the entire Latino population hold a high school diploma; in 28 of the 37, fewer than 70 percent of all Latinos have completed high school. But the picture is better among the native-born: In 27 of the 37 cities—including most of the big Sun Belt metropolises such as Los Angeles, Phoenix, and Las Vegas—at least 80 percent of them hold high school diplomas. In the remaining ten, only between 70 and 80 percent of adult native-born Latinos hold high school diplomas; with the prominent exception of Houston (which finishes just below 80 percent), these lagging cities include mostly communities in California's Central Valley (such as Modesto and Fresno) and the Rio Grande Valley in Texas (such as Brownsville). The gaps are greater in college attainment across these areas of population concentration. In ten of these cities—including Washington; Durham, North Carolina; San Francisco; San Jose, California; Ann Arbor, Michigan; Austin, Texas; New York; and Boston—at least half of working-age whites hold a college degree. Between 40 and 50 percent of whites are college-educated in 26 more cities, and between 30 and 40 percent in 67 others. Taken together, that means at least 30 percent of whites hold college degrees in 103 metropolitan areas. By contrast, in the cities with 200,000 African-Americans, only in the Washington area do as many as 30 percent of them hold a college degree; in the cities with large Hispanic populations, even the native-born reach that level in only three: Miami, Atlanta, and Washington. From the other end, fewer than 30 percent of whites hold college degrees in about one-quarter of the cities where at least 200,000 of them live (35 of 138). But fewer than 30 percent of blacks hold college degrees in over 97 percent of the cities where they are most numerous (35/36). Likewise, fewer than 30 percent of adult native-born Hispanics hold college degrees in 92 percent of the cities where they are most plentiful (34/37).